A number of important questions related to distal humerus fractures remain unanswered. First, despite being relatively more infrequent than in other locations and their changing epidemiological features, they are becoming important giving the rising incidence of complex fractures in young patients after serious accidents (car accidents, sports, labour), osteoporotic bone in elderly patients, who increasing in number more countries than some years ago as well as other factors [1Bégué T. Articular fractures of the distal humerus. Orthop Traumatol Surg Res 2014; 100(1)(Suppl. ): S55-63. [http://dx.doi.org/10.1016/j.otsr.2013.11.002] [PMID: 2446 1911] ]. All the different management modalities give different, and sometimes unpredictable outcomes time over so review studies can help determine where we stand nowadays. In order to properly define how to start distal humerus fracture treatment, a better understanding not only of bone anatomy but also fracture mechanisms and the soft-tissue enveloping the bone including neurovascular structures around the elbow should help improve out	comes. Three-dimensional (3-D) distal humerus characteristics in patients with complex fractures can be very nicely described with the use of Computed Tomography (CT) imaging after conventional radiograhs are performed. Jacquot et al., showed that CT improved diagnostic accuracy and could change the surgical strategy [2Jacquot A, Poussange N, Charrissoux JL, et al. Usefulness and reliability of two- and three-dimensional computed tomography in patients older than 65 years with distal humerus fractures. Orthop Traumatol Surg Res 2014; 100(3): 275-80. [http://dx.doi.org/10.1016/j.otsr.2014.01.003] [PMID: 2470 9303] ]. This accuracy was mainly dependent on image quality and interpretation rather than years of observers experience. Once the fracture pattern is well-described, the principles of column stability in addition to articular involvement are critical as the authors mentioned. Both the OTA and Jupiter classification systems are equally effective in order to outline surgical planning [3Marsh JL, Slongo TF, Agel J, et al. Fracture and dislocation classification compendium - 2007: Orthopaedic Trauma Association classification, database and outcomes committee. J Orthop Trauma 2007; 21(10)(Suppl. ): S1-S133. [http://dx.doi.org/10.1097/00005131-200711101-00001] [PMID: 1827 7234] , 4Jupiter JB, Mehne DK. Fractures of the distal humerus. Orthopedics 1992; 15(7): 825-33. [PMID: 1630966] ]. Todate, the surgical approach must be based on softtissue characteristics and bone quality in order to choose between a submuscular or olecranon osteotomies. Deciding between these surgical approaches needs to consider not only final elbow function results but also to address the possibility and rates of complications. A low-to-moderate loss of motion is not more important than neurological injuries, poor soft-tissue coverage or an unstable joint. It is important for the orthopaedic surgeon to recognize the connection between the proximity of neurovascular structures and surrounding thin soft-tissues. The authors of the current review are right in emphasizing this issue. We need to identify and resolve any abnormalities during the beginning of our initial evaluation of a patient. Whatever the surgical approach chosen, neurovascular injuries must be avoided and attention to this point must be paid.during surgery. Ulnar nerve transposition, although not universally recommended, can decrease neurological symptoms during the recovery process. Another issue is wound healing, Lawrence; et al. found after analyzing 89 fractures that 15.7% developed a major wound complication requiring an average 2.5 additional surgical procedures (range, 1-6) [5Lawrence TM, Ahmadi S, Morrey BF, Sánchez-Sotelo J. Wound complications after distal humerus fracture fixation: incidence, risk factors, and outcome. J Shoulder Elbow Surg 2014; 23(2): 258-64. [http://dx.doi.org/10.1016/j.jse.2013.09.014] [PMID: 2433 2475] ]. They concluded that the incidence of major wound complications after fixation of a distal humerus fracture was very important, particularly in open fractures treated with an olecranon osteotomy stabilized with a plate despite bone union was usually obtained. Proper bone management, in young and stronger bone usually considers open reduction and internal fixation as the gold standard. Both parallel and 90º-90º plate configuration have been widely evaluated in both specimen-biomechanical and clinical studies during last years. 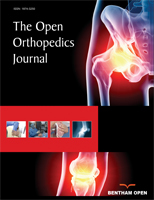 Newer technologies are welcomed as long as they can provide an early joint mobilization without the loss of articular and extra-articular reduction, and this must be confirmed intra-operatively. Finally, total or partial elbow arthroplasties in low-demand situations with “bag bones” fractures should be done with caution. Since the latest studies have confirmed the good results in terms of pain and function, a careful individualized approach must be made before going to the operation room. A thorough knowledge of fracture patterns is necessary in order to properly treat and restore ideal elbow biomechanics. Intra-articular reduction and stability of the distal humerus are critical to achieve successful outcomes. All other abnormalities may affect joint congruency and union rate. High-quality evidence is needed: the best surgical approach for open reduction and interal fixation of these fractures is yet to be determined [6Sharma S, John R, Dhillon MS, Kishore K. Surgical approaches for open reduction and internal fixation of intra-articular distal humerus fractures in adults: A systematic review and meta-analysis. Injury 2018; S0020-1383. ]; evidence for the best dual plating configuration is also lacking [7Nowak LL, Dehghan N, McKee MD, Schemitsch EH. Plate fixation for management of humerus fractures. Injury 2018; 49(Suppl. 1): S33-8. [http://dx.doi.org/10.1016/S0020-1383(18)30300-0] [PMID: 29929 690] ]. Indication for total elbow arthroplasty has grown due to the changing indications ranging from rheumatoid arthritis to traumatic conditions over the last years. Barco et al., in a ten-year-minimum follow-up study ound good pain relief and function in low demand patients but at a cost of a number of major complications: 11% deep infection rate, 18% implant revision or resection, and 11% periprosthetic fracture rates, their best results were obtained in patients without rheumatoid arthritis [8Barco R, Streubel PN, Morrey BF, Sanchez-Sotelo J. Total Elbow Arthroplasty for Distal Humeral Fractures: A Ten-Year-Minimum Follow-up Study. J Bone Joint Surg Am 2017; 99(18): 1524-31. [http://dx.doi.org/10.2106/JBJS.16.01222] [PMID: 28926381] ]. The current article also emphasizes that total elbow arthroplasties with or without a previous osteosynthesis can give similar results [9Prasad N, Dent C. Outcome of total elbow replacement for distal humeral fractures in the elderly: a comparison of primary surgery and surgery after failed internal fixation or conservative treatment. J Bone Joint Surg Br 2008; 90(3): 343-8. [http://dx.doi.org/10.1302/0301-620X.90B3.18971] [PMID: 18310 758] ], however, these findings have not been confirmed by others. Current evidence supports the known key points to management of these fractures: open reduction with anatomical reduction and best configuration stability using the most predictible surgical approach are best for most patients. Soft-tissue management is critical in order to decrease the number of complications and arthoplasty should be restricted to low demand patients with a low infection risk. Sharma S, John R, Dhillon MS, Kishore K. Surgical approaches for open reduction and internal fixation of intra-articular distal humerus fractures in adults: A systematic review and meta-analysis. Injury 2018; S0020-1383.